Silly Bee's Chickadees: Silly Bee's Beauty- Vote for my Nails! I'm really not the nail art kinda gal, but while trolling around makeup blogs, I found this nail design contest which I could not pass up! You know how I love design contests and this is a medium that totally caught my eye. So, I gave it a look-see. Polish or Perish, a fun blog all about nails, is hosting a contest for Inque Nails which makes and sells nail wraps kinda like the ridiculously expensive salon-only Minx nails which celebs Rhianna and Katy Perry wear. 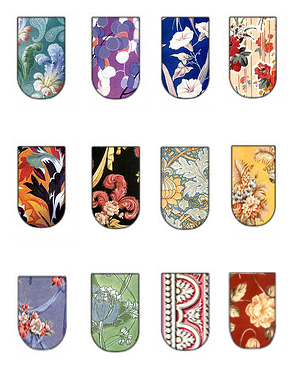 There are several at-home nail wraps on the market, but what sets Inque apart is their production capabilities. Because they print each set upon order, they are able to create custom designs using your own images and nail measurements! Please vote for my nails! Go to Polish or Perish and look for the voting box in the right sidebar. 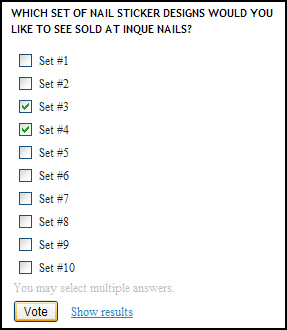 Check the boxes for Set #3 AND Set #4 (you can select more than one) and hit the Vote button. Voting closes Wednesday, April 6. Thanks in advance and please spread the word! I really like nail designs like this. 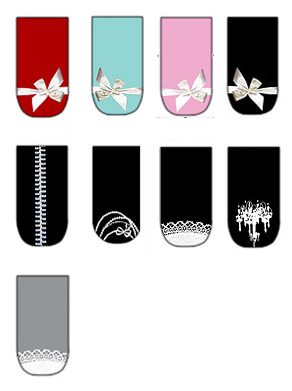 Back in January I tried the Sally Hansen nail strips (they were sparkly pink) I would love try those black and white designs! Thanks! I've bought the Sally ones, Nail Fraud and Broadway ones and plan to do a little review in a month or so.